Which witch show is which? The arrival of a new trio of Charmed ones and a certain enchanting teen proves that witchy offerings on the big and small screen are no longer relegated to Halloween, or even the month of October. And it’s not hard to see why tales about powerful women fighting persecution through magic resonate so much right now. But with five witch-centered series currently airing or streaming —including the OpenTV web series Brujos and an upcoming Chicago-based show titled Brujas—The A.V. Club decided it was time to take a closer look. Here, we help our readers determine who at least glanced at the Book Of Shadows before conjuring up a story. Which witch is this? Honestly, the Satanic Temple had a point when they said CAOS gave Satanists a bad name. Although the Spellman family and their fellow witches and warlocks worship the goat-headed god Baphomet—first conceived by French artist and occultist Éliphas Lévi in 1856, and frequently used as the symbolic incarnation of Satan—the Satanic Church of the Night’s brand of magic has very little in common with the actual Left-Hand Path, as practitioners of so-called “black magic” prefer to call their belief systems. Neither of the major Satanic groups, The Church of Satan and The Satanic Temple, believe in Satan as a literal deity, for one. (There are a few theistic Satanists out there who do believe in an actual devil, but not in great enough numbers to be statistically significant.) And even if they did, they don’t believe in forcing anyone, let alone minors, to join up. They’re all about free will. Which witch is this? 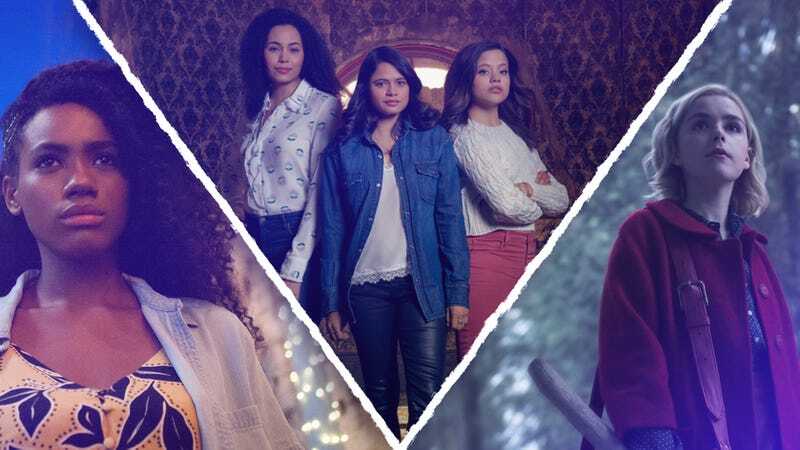 There are three in Jennie Snyder Urman’s Charmed reboot: sisters Macy (Madeleine Mantock), Mel (Melonie Diaz), and Maggie (Sarah Jeffery), who discover they’re witches after their mom dies. Their magical abilities have been slightly tweaked; what was once Phoebe’s (original cast member Alyssa Milano) premonition is now Maggie’s telepathy. They’re still strongest when they’re working together, so the Power Of Three remains intact (aww). Which witch is this? The source material for A Discovery Of Witches is Deborah Harkness’ historical-fantasy novel of the same name, which was in turn inspired by Harkness’ work as a historian and her decades-long private research into magic and the occult. The spell-casters on this Sundance Now series are a special brew—they’re informed as much by Harkness’ studies of “the transition from the superstitious Middle Ages to the rational, science-loving Enlightenment” as they are the occult. Dr. Diana Bishop (Teresa Palmer) is a very powerful, very undisciplined witch who’d much rather get tenure at Oxford than join a coven, but soon destiny—and a dreamy vampire played by Matthew Goode—come calling. As for what these witches actually believe, vague gestures are made towards a pagan nature religion akin to Wicca: “I was a witch like you ... we believe in the natural order of things,” an undead witch tells the biological daughters she’s never met (don’t ask) in one episode. That being said, the actual mechanics of the spells performed on screen are more reminiscent of the alchemical and theological systems of hermetic magic than Wiccan goddess-worship. Not that it really matters in the context of the show, whose characters spend a lot more time discussing who has a crush on whom than the philosophical underpinnings of the duality between “light” and “dark” magic. Which witch is this? Caracól Television’s Siempre Bruja, which was inspired by Isidora Chacón’s novel, Yo, Bruja, centers on a time-traveling witch named Carmen (Angely Gaviria). When we first meet her, Carmen is a slave in 17th century Cartagena, who’s on trial for being a witch. She’s condemned to death, but as the flames grow around her at the stake, she begins to chant. Suddenly, she washes ashore in Cartagena some 300 years in the future, where she’s in only slightly less danger. Siempre Bruja is part Buffy The Vampire Slayer, part Outlander—there’s plenty of teen drama mixed in with the time jumps. Though it’s not referred to by name (at least, not in the first half of season one), there are plenty of clues that suggest Carmen and the other witches in the story are followers of Santería, which has a long history in Colombia. She chants in Lucumí, a variation of Yoruba that’s used as the spiritual language of Santería. (In fact, “Lucumí” can also be used as a synonym for the belief system itself.) Carmen also acts as a curandera, using plants to heal wounds in the past and present. She’s also able to communicate with ghosts, and spiritism is a huge part of Santería.